Epoq EPP-HH01 Pico Cube Video Projector | OhGizmo! By Andrew Liszewski on 11/03/08 • Leave a comment! 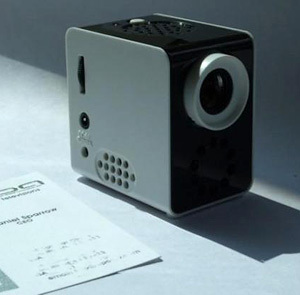 While it might not be the world’s smallest video projector in existence, the Pico Cube from Epoq could actually be the smallest video projector you can actually buy right now. (Or at least in the very near future.) But given its small size, if you were hoping to recreate the digital cinema experience in your living room or at the office, this isn’t the projector for you. It uses a 3W LED lamp that results in a brightness of about 7-10 ANSI lumens and a contrast ratio of about 80:1. On top of that it’s only capable of projecting a VGA, or 640×480 image from its composite video input which means you can’t even connect a laptop to this thing using a standard VGA connector for your PowerPoint presentations. So unless you absolutely need a low-end projector that can fit in the palm of your hand, I think you’d be better off wasting the $229.95 that Gadget Craver wants for this somewhere else.